As published in the Watertown Daily Times Newspaper, Watertown, Wisconsin, 53094. Taken from Micro film Library at Watertown Public Library in Watertown, Wisconsin. August F. Kusel Dies Last Night At Family Home. August F. Kusel, member of an old Watertown family and one of the few remaining civil war veterans in this section, died last night at his home, 414 North Water street. Death claimed him at 7:30 o'clock and was due to infirmities of age. Mr. Kusel was the son of the late Daniel Kusel, founder of the present day D & F Kusel Co. He was born in Domnitz, Mecklenberg, Germany on March 29, 1843 and came to America in 1849. 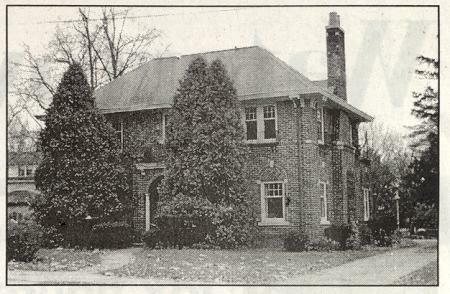 The family settled in Watertown and had been his home ever since with the exception of a few years which he spent in Nebraska. His services in the civil war started on August 18, 1862 with his enlistment as a sergeant in Co. E 20th Wisconsin regiment, volunteer infantry, which was Watertown's own company. He was wounded in the historic battle of Prairie Grove and was returned to the north and spent three months in a Madison hospital. He was honorably discharged on April 25, 1863. Following his discharge he returned to Watertown and went to work for his father in his tin-shop in West Main street where he continued work for a short period. Then he went west and established a general store in Logan, Neb., where he served as postmaster for a number of years. 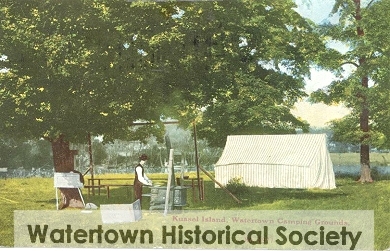 In 1872 he returned to Watertown where he resumed his work as a tin-smith until his retirement some years ago. Mr. Kusel's wife, formerly Margareta Heller, preceded him in death some years ago. They were married in the west. Four children survive, Mrs. Edward Luther and William Kusel of Hooper, Neb., Mrs. William Meschke of Rochester, Minn., and Mrs. Henry Hilbert who resides at the Kusel home in this city. There are five grandchildren. 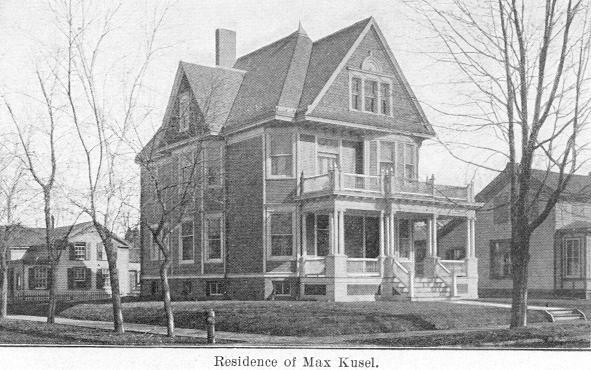 Mr. Kusel was the last surviving member of his family. He was a St. Mark's Lutheran church and was one of the few remaining members of the O. D. Pease post, G. A. R. when it disbanded a few years ago. With his death, there remain but two civil war veterans in Watertown, Sebastian Blonigan and Joseph Haberkorn. A short time before his death, Mr. Kusel recalled that as far as he knew only one of his old civil war comrades who served in the same company with him was still alive. He August Schmutzier of Beaver Dam. Mr. Kusel was a pituresque man. He was keen and alert despite his great age and enjoyed having visitors and callers. He enjoyed talking over old times and until his eyes began to fail him he was an avid reader. In recent years he had been confined to his home but always manifested a great interest in community events. The funeral will be held Wednesday afternoon from their home where services will be conducted at 1:30 o'clock followed by services in St. Mark's Lutheran church, the Rev. Julius Klingmann officiating. Burial will be in the Lutheran cemetery. The body was taken to the Norwack funeral home and will be returned to the home Tuesday where friends may call to pay their respects Tuesday afternoon and evening and Wednesday up to the time of the service. Friends are requested to omit flowers.